Allergy Standards Limited (ASL), the International standards and Certification Body (CB) for allergy labelling, announced today that some bedding products from Allied Home have passed the relevant Certification Standards. The product will now be added to the certification product database (CPD) and will therefore be eligible to join one or more of the asthma & allergy friendly®Certification Programs in association with the relevant national patient advocacy group. How did the Organic Pillow and Duvet obtain the Certification? The ASP:02:16 Feather and Down Filled Certification Standard is targeted to bedding products that are scientifically proven to reduce exposure to asthma and allergy triggers. 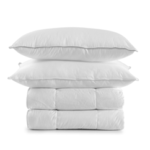 The Certification Standard utilizes an algorithm of proprietary and recognized scientific techniques to assess different type of bedding products such as duvet and pillow for their ability to reduce allergenic and irritant materials. Product samples that pass certification testing are granted a certificate stating that the particular bedding item meets the requirements for the asthma & allergy friendly® ASP:02:16 Certification Standard. Feather and down filling must not contain evidence of significant mite or serum protein contamination. Feather and down must not contain evidence of significant bacterial or fungal contamination. Allied Home then obtained the certification after the products they sent for testing passed the tests and met the scientific requirements. “We thoroughly tested these products and are happy to announce that bedding from Luxeport and ALLIED Home have achieved the standard and are proven to be appropriate for those who want to reduce allergens in their bedrooms and improve air quality in general,” said Dr. John McKeon, CEO of ASL. Allied home is the finished bedding division of Allied Feather & Down, the largest global supplier of premium responsibly-sourced down to the outdoor and apparel industry. Using their decades of experience, they are able to provide the finest and most innovative luxury down bedding. As their goal is to bring premium quality products to their consumers, certifying some of their products as asthma & allergy friendly® was a coherent step moving forward.